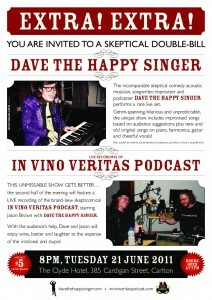 « Dave The Happy Singer and In Vino Veritas Podcast LIVE in Melbourne! Thanks for a great time, Melbourne friends! Last week’s live double-bill at the Clyde Hotel in Carlton, Melbourne was fantastic. I had a thoroughly great time. I’ve written up the live recording of our funny skeptical podcast In Vino Veritas over on the VinoCast blog but I’d like to add that it was a joy to play some of my own set in front of such a friendly audience. Jasmine videoed the gig, so we will pull out some highlights for YouTube when time allows. The live recording of VinoCast will be up as episode 3 before too long and I’m sure we’ll be talking more about it when we record again. Subscribe now to get it straight away! And if you haven’t heard the crazy episode 2 yet, now may be the time! 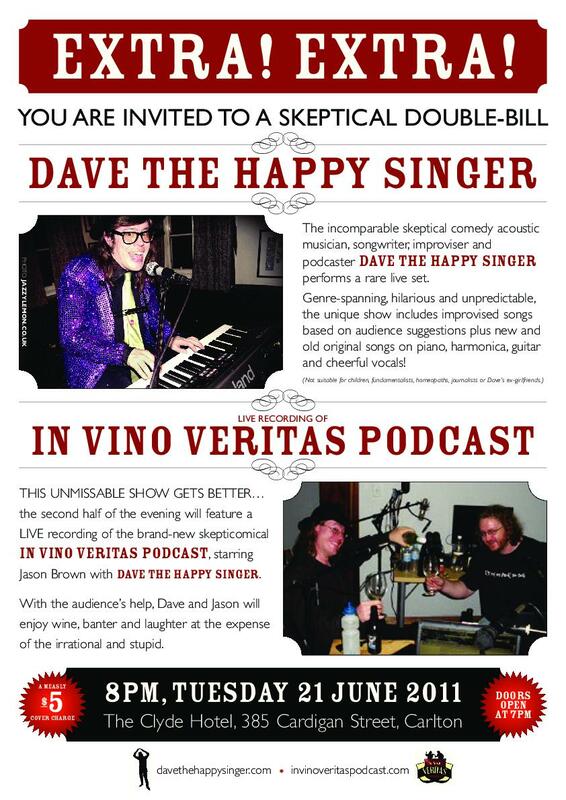 If you’d like us to come and bring the In Vino Veritas LIVE show to your town, let us know! We’d be delighted to, and all we need is a decent crowd and some help promoting the show locally. Let’s chat. 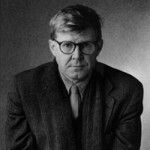 This entry was written by Dave The Happy Singer, posted on July 1, 2011 at 10:32, filed under Events, In Vino Veritas, Podcasts and tagged gigs, In Vino Veritas LIVE. Bookmark the permalink. Post a comment or leave a trackback: Trackback URL.